With the advancements in player tracking technology, the topic of fatigue and pacing in team sport has become increasingly popular in recent years. Initially based upon a pre-conceived pacing schema, a central metabolic control system is proposed to guide the movement of players during team sport matches, which can be consciously modified based on afferent signals from the various physiological systems and in response to environmental cues. On the basis of this theory, coupled with the collective findings from motion-analysis research, we sought to define the different pacing strategies employed by team sport players. 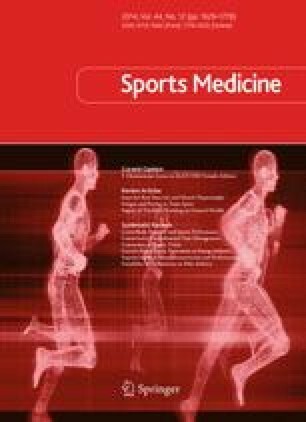 Whole-match players adopt a ‘slow-positive’ pacing profile (gradual decline in total running intensity), which appears to be global across the different team sports. High-intensity movement also declines in a ‘slow-positive’ manner across most team sport matches. The duration of the exercise bout appears to be important for the selected exercise intensity, with the first introduction to a match as a substitute or interchange player resulting in a ‘one bout, all out’ strategy. In a limited interchange environment, a second introduction to the match results in a ‘second-bout reserve’ strategy; otherwise, the ‘one bout, all out’ strategy is likely to be adopted. These pacing profiles are proposed to reflect the presence of a central regulator that controls the movement intensity of the player to optimize performance, as well as avoiding the harmful failure of any physiological system. The presence of ‘temporary fatigue’ reflects this process, whereby exercise intensity is consciously modulated from within the framework of a global pacing schema. No sources of funding were received in the preparation of this article and the authors have no conflicts of interest directly relevant to its contents. Tucker R, Noakes TD. The physiological regulation of pacing strategy during exercise: a critical review. Br J Sports Med 2009;43(6):e1. doi: 10.1136/bjsm.2009.059360. Australian Football League (AFL). AFL Commission introduces 120 limit on interchanges. http://www.afl.com.au/news/2013-08-27/rotations-capped-at-120. Accessed Nov 2013.